Throughout your UNA career, you may discover you have a need to connect with other resources. The offices described and linked below are waiting to help you make the most of your UNA experience. The UNA Financial Aid office will help you find out about student loans, grants, scholarships, and other financial information. They are also available if you need assistance completing your FAFSA or with any other issue that may arise with your financial aid. The office of the Registrar is where your academic records are kept. The office staff is available to help you with dropping and/or adding courses, repeating and/or re-computing classes, and ordering copies of your official or unofficial academic transcript. The staff at the UNA Career Center will help you explore your likes and dislikes, strengths and weaknesses, and skills and talents. They will help you discover not only what major is best for you, but what careers you will be most suited for when you graduate. As you evolve through your UNA experience, you will find this resource to be very valuable when you need assistance with developing your resume or interviewing skills. If you have, or suspect you may have, a learning, psychological, or physical disability, the staff at the Disability Support Services office may be able to help you receive classroom accommodations to better enable you in your academic pursuits. You may be tempted to avoid asking for assistance; this is a mistake. Everyone needs help at some point in life and you are encouraged to seek the help necessary for academic success. If we are not made aware of your need for help, then we won't be able to help you. So reach out to Disability Support Services; they are here for you! For help with stress and beyond, confidential services are available to all actively enrolled students who have paid the Student Wellness Fee. Outpatient mental health services include: Psychosocial Assessments, Individual and Group counseling, Crisis Intervention, Group Psycho-educational and classroom presentations, Referrals to community resources. You can't succeed in your education if you are not taking care of your body. University Health Services provides medical care and preventive services (such as immunizations) to help you stay healthy. Stuff happens…University Health Services is here. College life is more than taking classes. You may wish to have a well-rounded experience while you are here at UNA. The best way to do this is for you to become active in your university community. The Office of Student Engagement can help you find clubs or activities to help you both meet new people and build up your resume. If circumstances arise that don't fall under the offices linked above, you can inquire with the Division of Student Affairs and they will assist you with finding a solution to your particular situation. 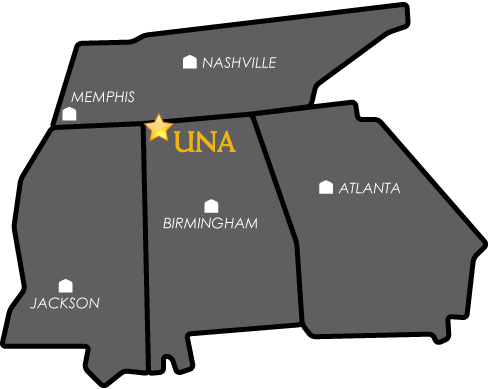 You will find information about the various departments and programs of study here at UNA at the Office of the Vice President for Academic Affairs & Provost. You can read a message from UNA's Provost on the Academic Affairs home page and follow the links to learn more about the different department and programs. You can find bus schedules, sign up for emergency alerts, check campus policies, and explore other related programs and information on the Campus Police homepage. Another helpful service provided by the Campus Police is the handling of Lost and Found items. Don't hesitate to call on the Campus Police if you are in need of their services.